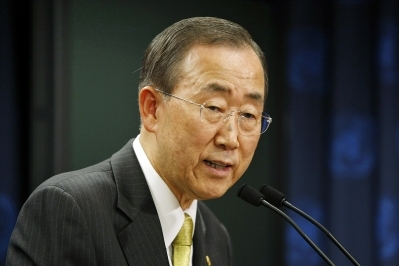 UN Secretary General Ban Ki-moon, whose latest report on human rights abuses in Iran specifically highlighted the country's ongoing "discrimination and harassment" of its Baha'i community. The news of human rights violation in Iran is at the top of the global communities human rights concerns. UNITED NATIONS — The Secretary General of the United Nations, Ban Ki-moon, has once again expressed strong concern over Iran’s ongoing human rights violations, including its persecution of Iranian Baha’is. In a report issued Thursday, Mr. Ban highlighted his continuing concerns over Iran’s use of torture and the death penalty, its poor treatment of women, and repeated violations of due process of law and of freedom of assembly, speech and religion. The report also strongly criticized Iran’s failure to protect the rights of minorities, such as the Baha’i, Sufi, Baluch and Kurdish communities. This year’s report quite specifically highlighted Iran’s ongoing “discrimination and harassment” of its Baha’i community. “Members of unrecognized religions, in particular the Baha’i, who comprise the country’s largest non-Muslim religious minority, face multiple forms of discrimination and harassment, including denial of employment, Government benefits and access to higher education,” said the report. “Some members of the Baha’i community have faced arbitrary detention or the confiscation and destruction of their property. “Fires had been deliberately set to partially or totally destroy homes and vehicles, and a cemetery in Marvdasht had been vandalized. The incident was allegedly reported to a number of Government agencies, but no official action has been taken,” the report said. The report also took note of the trial and reported sentencing of seven Baha’i leaders, observing that the UN High Commissioner for Human Rights has expressed “deep concern” over the absence of international observers and the lack of due process in that trial, which concluded in June. “The High Commissioner voiced grave concern that the criminal charges brought against the above-mentioned individuals appeared to constitute a violation of the Islamic Republic of Iran’s obligations under the International Covenant on Civil and Political Rights, in particular those of freedom of religion and belief and freedom of expression and association,” said the report. Mr. Ban’s report was released in response to last year’s resolution of the UN General Assembly on human rights in Iran. That resolution specifically asked the Secretary General to report on any progress Iran makes during the year on human rights issues. It is the third such report that Mr. Ban has issued on human rights violations in Iran in as many years. “What is surprising is the degree to which the government of Iran has completely ignored these annual reports from the UN Secretary General, who has so clearly articulated in them the international community’s concerns about Iran’s failure to meet its human rights obligations,” said Bani Dugal, the principal representative of the Baha’i International Community to the United Nations. “For three years now, Mr. Ban has called attention to Iran’s abusive and illegal treatment of women, juveniles, minorities, and journalists, not to mention common citizens who merely wish to voice their own concerns. “Mr. Ban has also repeatedly expressed concern over Iran’s systematic and on-going persecution of the Iranian Baha’i community, who are discriminated against solely because of their religious belief. “We believe that the time has come for the UN General Assembly – to which this report is directed – to appoint a special envoy to monitor the human rights situation in Iran,” said Ms. Dugal. The Baha’i World News Service has published a Special Report which includes articles and background information about the seven Iranian Baha’i leaders – their lives, their imprisonment, trial and sentencing – and the allegations made against them. It also offers further resources about the persecution of Iran’s Baha’i community. The International Reaction page of the Baha’i World News service is regularly updated with responses from governments, nongovernmental organizations, and prominent individuals. The Media Reports page presents a digest of media coverage from around the world. Thank’s for helping Iranian people.there in no meaning for human rights in Iran.